Home Blog Genuine LG G3 Wireless Chargers now in stock! Genuine LG G3 Wireless Chargers now in stock! Picked up the LG G3? Now grabbing all the accessories? We just received another shipment of the Genuine LG G3 Wireless charging docks. Unlike other wireless chargers from other Smartphone companies, this Charging dock, can prop itself up to give you an easy to see viewing angle, and doesn't lay flat on the desk or bedside table. Weighing in at only 88grams, and the ability to be folded flat, this wireless charging dock is great to take with you on work trips, or holidays. Whether you're watching a movie, or just reading some text, you can do it while your handset is recharging its batteries sans wires. And the phone can be supported in both portrait and landscape mode. Charging the LG G3 with the WCD-100 is literally foolproof. And in addition to wireless charging, the accessory makes for a nice smartphone dock, too. 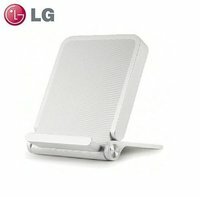 You won't go wrong with LG's offering if you are looking for any of the two, but bear in mind that the stand won't work for tablets. The recommended input stands at 1.8mA - being a perfect fit for the LG G3 included wall charger. The Genuine LG G3 Wireless charger is available now, at Gadgets 4 Geeks.